Periods of rain. Low 57F. Winds E at 5 to 10 mph. Chance of rain 90%. Rainfall near a quarter of an inch.. Periods of rain. Low 57F. Winds E at 5 to 10 mph. Chance of rain 90%. Rainfall near a quarter of an inch. Ann Lemons Pollack is a familiar figure in St. Louis food writing. She and her late husband Joe Pollack coauthored the books “Beyond Toasted Ravioli” in 1998, “Beyond Gooey Butter Cake” in 2001 and “St. Louis Eats” in 2005. Pollack continues to write about food in St. Louis Magazine and on her blog stlouiseats.typead.com. Her latest book, “Lost Restaurants of St. Louis,” is a nostalgic look back at beloved local eateries. An introductory chapter elaborates on how St. Louis responded to the logistical challenges of feeding the thousands of visitors to the 1904 Louisiana Purchase Exposition. Pollack cites an average daily attendance of over 87,000. Restaurants ranged from the exotic Tyrolean Alps Restaurant, the invention of August Busch and Tony Faust, which featured elegant food with corresponding high prices; to the Ralston Purina lunchroom, where most offerings cost 10 cents. Pollack offers brief vignettes of 43 memorable restaurants. She includes details about location, décor, signature dishes and when the restaurant closed. The entries are arranged alphabetically and are packed with entertaining anecdotes. Pollack writes that Ruggeri’s was such an integral part of the community that the St. Louis Star-Times reported when the first waiter from the restaurant was drafted in World War II. The man who invented the car window tray for drive-in restaurants discovered St. Louis had no such restaurants and started the Parkmoor in 1931. At Stan Musial and Biggie’s Steak House, diners who could prove they lived in Musial’s hometown of Donora, Pennsylvania, could eat for free. Even national chains merit a mention if they have a special claim on St. Louis. The Naugles Tacos and Burgers on McCausland south of the Hi-Pointe Theater is an example. While Pollack focuses on notable restaurants that have come and gone, she also includes three long-standing institutions that are still open for business: Al’s Restaurant, Bevo Mill and Crown Candy Kitchen. Readers will find a few recipes of favorite dishes in the back of the book. Pollack provides a charming, nostalgic and informative tour of St. Louis restaurant history. 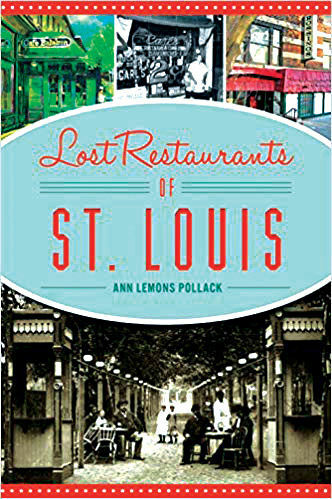 Ann Lemons Pollack will discuss and sign “Lost Restaurants of St. Louis” at 7 p.m. Tuesday, Dec. 4, at Left Bank Books, 399 N. Euclid Ave. Call 314-367-6731 for more information.